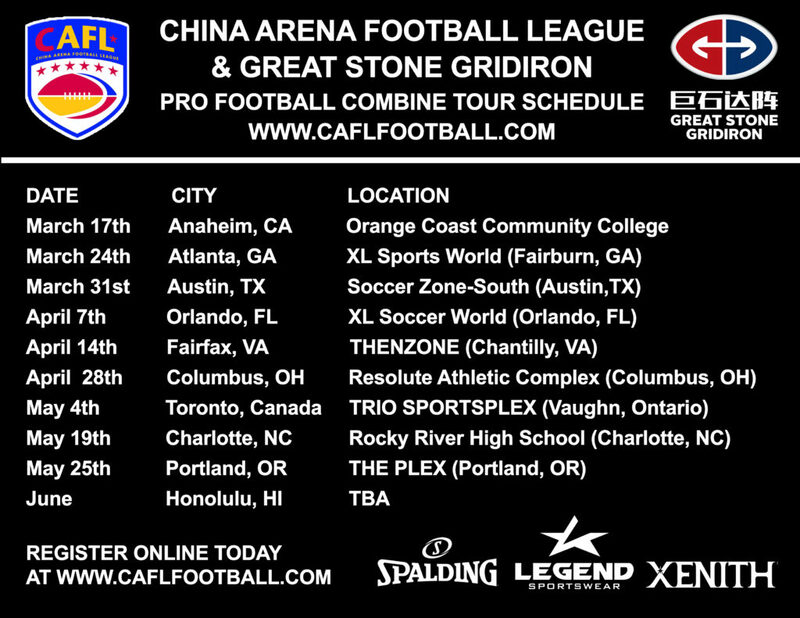 The CAFL-GSG 2019 Pro Football Combines are coming to a city near you and we’re searching for 100 athletes to be part of the fastest growing sport in China. That’s right! We’re bringing the opportunity for you to be one of the next football stars in China to your city! CAFL-GSG Pro Football Combines are two part events giving participants the opportunity to meet with CAFL executives staff members, coaches and current players to share their experiences in china and details about the opportunity ahead of them. It’s our way of allowing athletes, school administrators to local business leaders to earn more about all the economic, educational and career opportunities within the CAFL & GSG Partnership. On the field its all about the players and giving them the stage to display their true athletic ability, determination and position specific skills. In most cities our Combines will begin at 8:00am with player check-in and walk-up registration. In Fairfax, VA our Combine times will be 1:00pm – 6:00pm and in Portland, OR the times will be 12:00pm – 5:00pm. Are You Ready?! Early Player Registration is $50.00 and Walkup Registration is $75.00 per participant. TORONTO ONLY: Early Player Registration is $100.00 per participant. For more information please send serious inquiries only to our Football Operations Department to dbranch@afl-china.com. PLEASE NOTE: your registration is not completed and your application will not be processed until you have paid the $50 fee through PayPal. You do not need a PayPal account to use the PayPal checkout; any credit card can be used. If you have not received a PayPal confirmation, please contact dbranch@afl-global.com to request a PayPal invoice.